With a vision of the FUTURE and a clear social commitment, today TASSY also focuses its priorities on environmental protection. Combustion of solid and liquid fuels (coal, fuel oil, etc.) releases large quantities of heavy metals, dust and other harmful substances in combustion processes. Heating costs are precisely controlled and reported in real terms. TASSY Ltd. was founded in 1991. The headquarters and production facilities of the company are located in the town of Dolni Dabnik. The main scope of activity of TASSY Ltd. is the complete engineering in the construction of gas facilities and installations. This includes activities in the field of pre-feasibility study, design, supply of equipment and materials, construction, commissioning and servicing of linear, energy and industrial sites; petroleum products processing facilities; sites for natural gas preparation; cogenerations; compressor stations; automotive gas stations and others. The company is registered in the Central Professional Register of the Builder with protocol №0167 / 08.10.2009. 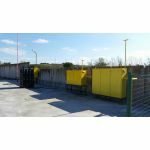 The company has built a significant number of industrial, public administrative and residential sites, as well as over 170 000 m of distribution and transmission gas pipelines. TASSY Ltd. is a member of the Bulgarian Natural Gas Association and Local Authority of the Bulgarian Industrial Association on the territory of Dolni Dabnik Municipality. TASSY Ltd. maintains a design department with highly qualified specialists and offers design services for gas pipelines, heating installations, gas facilities, air ducts, steam installations, compressed natural gas stations, technological lines and facilities, etc. taking into account the specific needs of each of its clients. • Design of detailed site development plans. • Preparation of Conceptual, Technical and Work projects. • Coordination of activities related to central and local authorities and stakeholders, etc. For its customers not having access to a gas pipeline, TASSY Ltd offers the supply of compressed natural gas (CNG) to them, as well as the construction of the relevant adjacent infrastructure for decompression of natural gas. 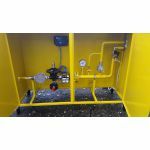 "TASSY" Ltd. designs and manufactures equipment for installations using compressed natural gas (CNG). 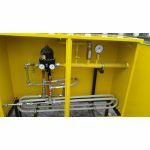 Decompressing and regulating stations (DRS) manufactured by us are products whose function is to lower the pressure of natural gas supplied by batteries or trailer to the consumer of 200 bar to 4 bar and subsequently to the required working pressure. They are also equipped with equipment for measuring the amount of gas consumed. 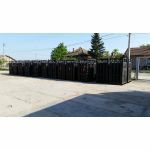 We also offer batteries for transportation and storage of compressed natural gas, produced by us, according to a size and type of the customer. • a comprehensive service for the organization and implementation of construction, installation, testing and commissioning of gas pipelines, heating installations, gas facilities, air ducts, steam installations, compressed natural gas stations, technological lines and facilities, etc. • development and implementation of process control and control systems, communication systems and data processing systems, etc. © 2017 TASSY ltd. All rights reserved. Created by it design adv.